I was happy to have been invited by my dear friend and fellow blogger Cynthia aka LifebyCynthia of Life By Cynthia to a recent Blogger event this past weekend. It was my first Blogger Event with this particular group of ladies. Tammy aka BayParkDream of Lemons, Avocados & The Bay was the host of the event. It was held at the Urban Skin Care Salon in the beautiful spot of Little Italy. Perfect location, was the start of a perfect night! I invited my friend, non blogger (for now), Monica to come along. As we found the cute little green house of Urban Skin Care we walked in and was immediately greeted by staff. We saw many other ladies mingling and having fun. We immediately met up with my Cynthia and her sister Carina, whom I haven't seen in so long. Also met Paulina from Lil Bits of Chic. She is such a sweet gal. Unfortunately we didn't get a picture together. We even had some treats! There was pizza by Napizza from around the corner. Who ever heard of Lasagna pizza or cranberry pizza? 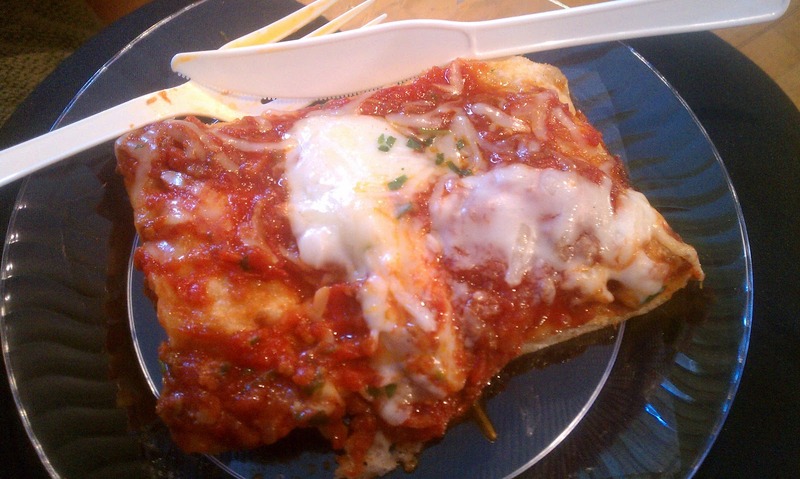 I didn't get to have the cranberry pizza but the lasagna pizza was oh so yummy...and different! Also, a delicious wine spritzer from Bon Affair. A new, up and coming beverage made with a Temecula Valley wine along with electrolytes, purified carbonated water and no sugar added. Sounds healthy huh? It's all natural! I sampled the Sauvignon Blanc which was crisp and refreshing. It is also available in Pinot Noir. The story behind Bon Affair is wonderful. Click here for their story. And they didn't forget dessert. There were rich, chocolaty brownies from a neighborhood restaurant called 98 Bottles. I avoided these when I first saw them, even though LifebyCynthia was telling me to try one. I "heard" it was made with beer. As we were hiding out in the beauty room with the makeup artists, Larissa from Urban Skin Care came in with the brownie tray and made us have a piece. OH SO DELICIOUSLY GOOD! That's all I can say! Salon services such as massages, skin consultations, manicures and makeup services were available for a low cost. It was all fun and lots of networking, giggling, mingling and FUN. Vanessa and Liz came to greet us and convinced us to get something done. I already had makeup on so I opted for lashes! Although I usually wear falsies when I go out, I just didn't have time to put them on. Chatting it up with Liz and Vanessa was so fun. They have so much knowledge in the makeup industry it amazed me. Being a makeup junkie, I love listening to information from others. They weren't only very knowledgeable, they were so fun and friendly. I hope to take some classes from them someday soon and to have them come and do a girls night party with us or something. Of course all gatherings always has the perks of goodie bags, swag bags, whatever you want to call it. In the bags were a few skin care goodies and an admission to FWSD coming in October. I had found out last minute, but was happy I was able to attend. I didn't realize you were in SD too. We must keep eachother posted. I think a few of us are going to try to make the FWSD event. We're waiting for details.